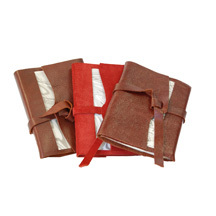 All of our books are handmade, hand-bound, and filled with sheets of handmade paper. Do you live in Columbus? Come to our space at 66 Parsons for your shop local discount!! The book you like sold? Let us know,it’s not too late,we love custom work! And at the same price too! We start by processing the fiber and pulling each sheet of paper by hand. 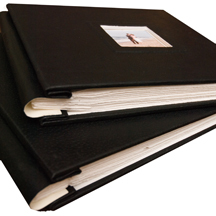 The books are then sewn and bound using quality materials and strong, durable binding techniques. The only material not made in house are the high quality leathers used for the spines of these wonderful blank journals. The pages are a cotton rag/abaca mix and are suitable for all wet and dry media; mixing the fibers as we do when we make paper for our book pages gives you a very versatile, strong paper that is still crisp and pleasant to touch. Recycled cotton rag is very durable, 100% natural, green, and archival. Abacca (also known as Puerto Rican hemp) is a khaki colored and hardy fiber that lends strength to the white cotton rag. We will occasionally make book pages from recycled acid free printmaking papers. Our books are made with solid quality boards & 50 pages of acid-free paper. All book sizes are approximate and may vary slightly. 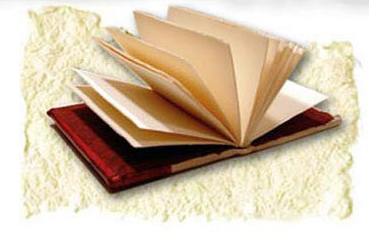 Filler papers are cotton rag or a mixture of cotton and abaca.